A new season of Baahubali The Lost Legends begins as a new threat to Mahishmati arises from out of its dark past. 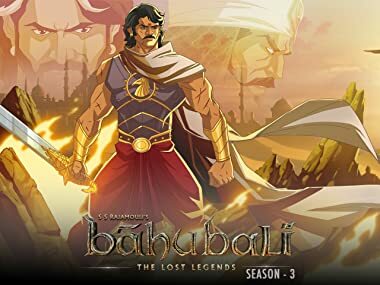 Baahubali and Bhallaladeva find themselves exiled from their own kingdom and must journey a great distance to expose the hidden past of Mahishmati and regain the throne for the honor of Rajmata Sivagami! As Mahishmati celebrates an era of peace the kingdom is shattered by the arrival of a mysterious stranger whose claims may shake its very foundation. The mysterious Dharamraj stares down Sivagami and challenges her right to rule as Baahubali and Bhallaladeva have to take an unthinkable step to save their kingdom. Baahubali and Bhallaladeva come across an unusual group of survivors in the woods as they begin their journey to save Mahishmati. A mysterious village where the the dead come back to life haunts Baahubali and Bhallaladeva in their quest to reveal the truth about Dharamraj. Baahubali and Bhallaladeva are under attack by unknown assailants in the dark woods as they struggle to fight back against their sinister attackers. Baahubali has to race against time to save his brother from an ancient threat that threatens to finish Bhallaladeva off once and for all. Dharamraj faces the biggest challenge yet to his rule - the people of Mahishmati. Baahubali seeks an alliance with the mysterious and ruthless warriors, known only as the Obsidian Blades. Separated from Bhalaladeva in the desert, Baahubali encounters the deadly and majestic desert warlord Zohravar. Zohravar reveals a secret about Dharmaraj as Bhallaladeva plots his own agenda. Baahubali and Bhallaladeva have run out of time as Mahishmati prepares to crown Dharamraj as their new king. The epic saga of Dharmaraj concludes and Mahishmati will never be the same again!